Watch our Striders in Action! Last weekend over 70 people joined forces to raise awareness of the UK’s fifth biggest cancer killer, pancreatic cancer, in an emotional and memorable walk around Windsor Great Park, Virginia Water. The annual event is organised by national charity Pancreatic Cancer Action and was an opportunity not only to raise funds and awareness, but also, remember loved ones lost to pancreatic cancer and honour those still fighting the disease. This video of the event shows the stories of Rachel Carder and Ashley Holland. Both had their lives changed 6 years ago when a loved one was diagnosed with pancreatic cancer. Unfortunately, the outcome of their stories is hugely different. Rachel explains why the event means so much to her: “We are striding for survival today because my mum was diagnosed with pancreatic cancer. It’s been about 6 years now. Pancreatic Cancer Action focuses on early diagnosis of pancreatic cancer, a disease which has the lowest survival rate of all 22 common cancers at just 5%. However, if the disease is caught in time for surgery then chances of survival significantly increase. 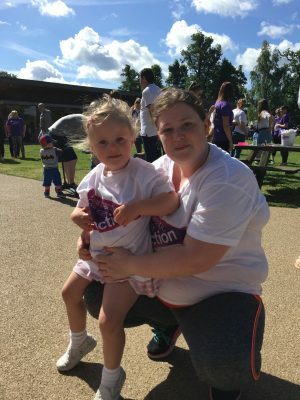 Pancreatic Cancer Action aim to raise awareness of the signs and symptoms with events such as Striding for Survival so that everyone can have the outcome of Rachel’s mum. Join us for the 2018 Striding for Survival event on the 3rd June at Virginia Water, Windsor great Park!